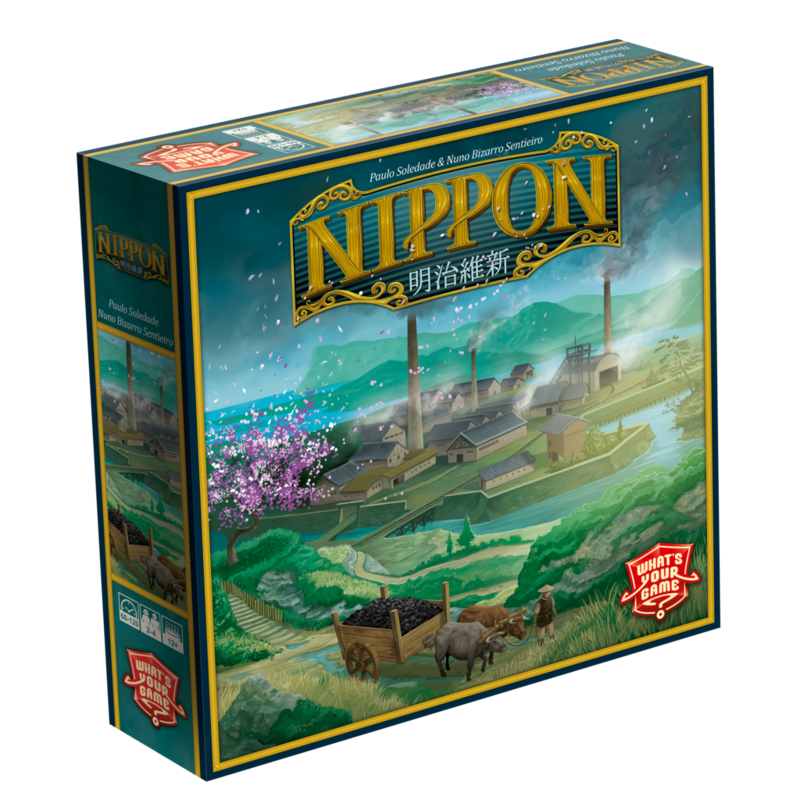 Although Nippon is a heavy euro and perhaps the heaviest we have reviewed on this site, it is a highly playable game. This is one of those games where you have a lot to think of in terms of strategy, but the choices you have each turn are quite limited, and therefore it doesn’t overwhelm you. It is for the most part, an elegant game. Nippon is a game of building a production ‘engine’ to sell the most goods and in the end be the most successful Zaibatsu. What is a Zaibatsu you might ask? Well let me tell you. Zaibatsu are big business conglomerates. In the wake of the industrial revolution, Japan was still a very closed of country. The Zaibatsu produced and fulfilled the demand of the domestic market in an area of important products. In Nippon you will build factories to produce your goods and keep the cash flowing and economic influence rising. How do you do that? At its core the game features what you might call an action selection mechanism. You chose a worker-meeple on a space with an associated action. This worker will have one of six colours. You then put this worker on your own player board. Some of the actions you take will increase your income track, your coal production track or your technology track, while other actions will let you build factories and yet others are about selling your goods. You want to sell your goods on the domestic market because this let you control the market of a particular good in an area of Japan. And during the game you will gain victory points based on your market dominance in these areas. 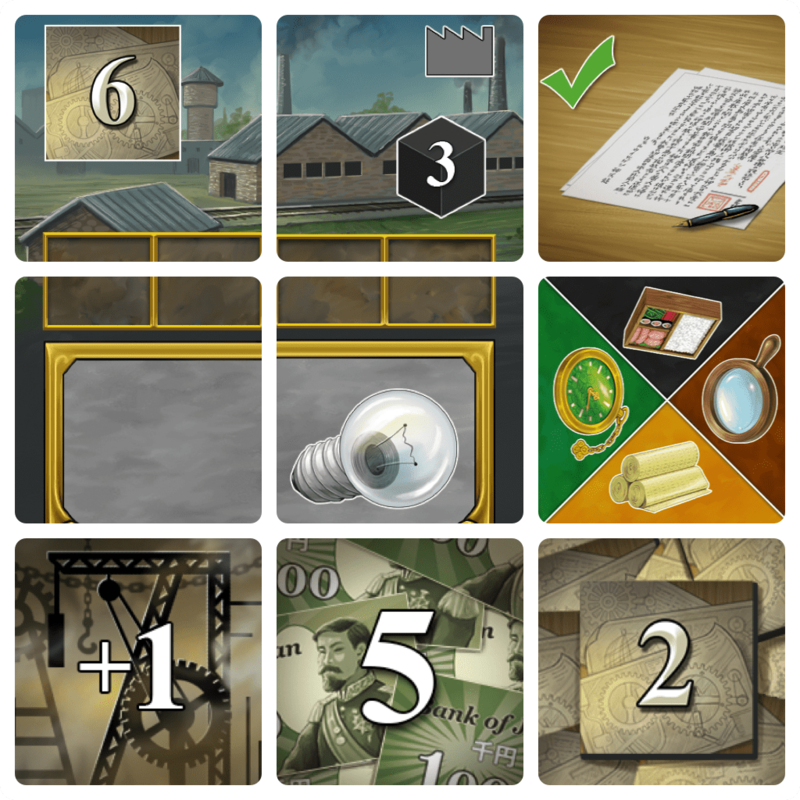 The game is played over a number of rounds out of which three are scoring rounds. The twist here is at that the length of rounds can vary quite a bit. You only advance the round tracker when all the meeples have been removed from the board. It is a bit more complicated than that, but suffice to say that the more of the same actions the players take the faster the rounds will go. I previously mentioned the colours of the meeples. This matters because every once in a while you are forced to consolidate your finances. In game terms this means getting rid of all your coal (used for production) and money and then resupplying it according to how far you are on your coal and money track. The trick is that after consolidating you have to pay your workers and the more colours you have, the more expensive it is. This creates a lot of tension in the game. Will your opponents take the action you really want or the colour you want? Should you take the action you want but the colour that will bother the next player the most? I love this feeling and it is what I like the most in the game. The second big part in the game is the area control part where you try to get economic influence in the various parts of Japan. This is where most of your victory points will be made as this part of the game scores three times. There is definitely also some tension and take that to be had there. But for me it isn’t as tense or exciting as the worker selection. Overall it is a very nice mix of ideas that makes an appealing whole. I really like this type of game. Games where there are many strategic layers but at the same time you are not overwhelmed by the choices you have in each turn. It is to the heavier side, so definitely NOT for everyone, but if you are, you know who you are and this game is for you. The meat of the game is the fun and original mechanics and they make for a game that is more than the sum of its parts. I had a lot of fun with the game. There is a lot of “will they do this or that” thinking about your opponents, trying to figure out when the scorings will occur and how many actions you can get in before that. To me that is fun. For a heavy euro game the theme is quite present. However you won’t be drawn in to the game by the theme unless you really have an affinity for Meji period Japan. The art in the game is well made but nothing out of this world. It is a little dry and doesn’t really draw you in. I like it but nothing outstanding. The map could have used some graphical distinction between the different areas. The rulebook is usable and you can definitely learn the game from it. Components are all adequate. You use black cubes as coal, markers on scoring tracks and pretty much everything else. It would have been a nice addition to use cubes of various colours for the various tracks and resources. For a game that is this deep with this many strategic layers, it is a fairly uncomplicated game. Yes it will take some time to read through the rulebook and the first game will see you playing without REALLY knowing what you are doing. But after the first game it is quite smooth sailing. Turns fly by and the game will be ending long before you know it. There is a bit of managing when some things happen and the players need to be on top of that, but even if you miss it as it happen, it is possible to fix it and not game breaking. This fun and informative video is really a great look at the game!